That's right, I'm turning 29 today, and I'm having a tough time deciding between Peanut Butter Cupcakes with Milk Chocolate Glaze and Mississippi Mud Cupcakes. I'm thinking either choice will be fine one. Paul came home from work with some beautiful purple tulips for me, but we're going pretty low-key on the celebrations today. My rather frail grandmother is in the hospital, and I'm waiting by the phone to hear how her emergency surgery went. In lighter news, have you heard about the NIT champions? Check out this T-shirt logo. Just think, some people don't think spelling is very important. 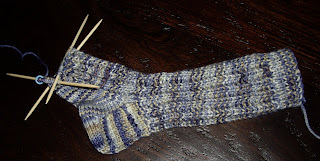 Just in the nick of time, my Feb/March Project Spectrum socks are off the needles and onto the feet. 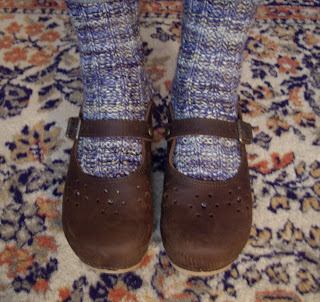 I'm modeling them with my comfy new Dansko clogs. Please ignore the somewhat hideous wool rug. What's up next? Some more socks for the new April/May Project Spectrum colors -- pink, yellow, and green. 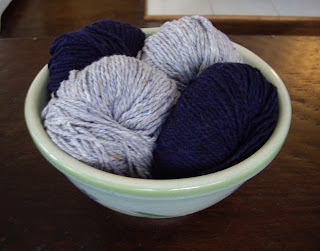 I'm going to use Cider Moon's Glacier yarn again, this time in "June Carter." My daffodils are finally blooming. 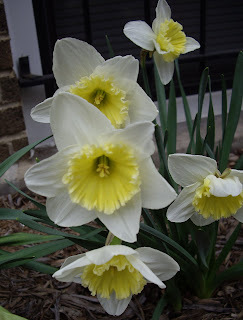 I have been so envious of the southern bloggers who have been showing off their spring flowers for nearly a month. I visited my family in Minneapolis over the weekend. 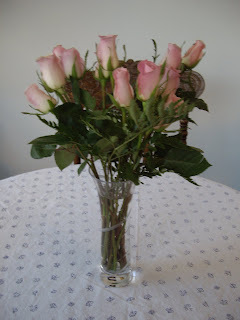 My parents have a very s*l*o*w dial-up connection; hence blogging has been light. We celebrated my b-day in advance, did some shopping, worked on the car (by the way, never buy a 2001 Chevy Malibu), visited the Walker Art Center and Mpls. Sculpture Garden, and cruised around the lakes for a bit. All in all a good weekend. It's unusual for Minnesota to be so balmy and lovely in March. 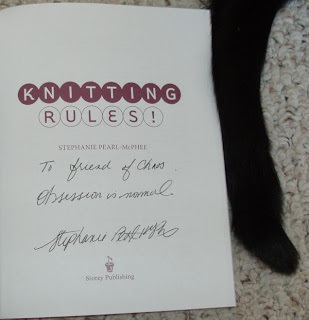 Yes, this book has been signed by her excellency the Yarn Harlot herself. The grading is done, at long last (insert huge sigh of relief). I am taking a break to read for pleasure before returning to preparations for my last prelim exam. 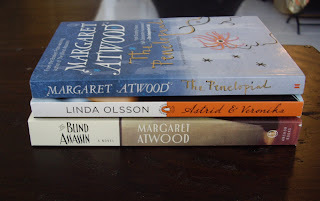 Right now I'm reading Margaret Atwood's The Blind Assassin, this month's book for Knit the Classics. What a great book so far -- very enthralling, and the structure of the novel, with all of its stories within the story, is interesting. I have to admit that this is the first book I have read by Margaret Atwood. This is a minor point, but I've been noticing the "Canadianness" of it. I realize that I read very few Canadian authors. The only exceptions are Robertson Davies and L.M. Montgomery. 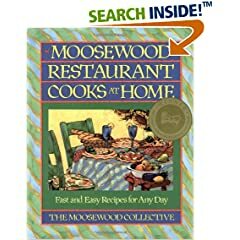 Does anyone have any more Canadian authors to recommend? 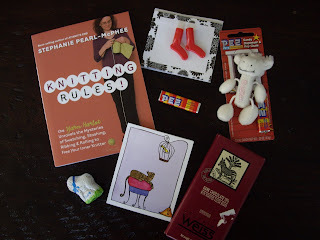 Mia over at Knit & Play with Fire has asked for book suggestions, and I am more than happy to oblige. Here are a few well-written books that I would highly recommend. - Winter’s Tale, by Mark Helprin. Enthralling and surreal, this epic book paints a vivid yet fantastic picture of New York over the course of the 20th century. - Cold Comfort Farm, by Stella Gibbons. Wit and humour mark this novel as it plays with the literary legacy of the Brontes, Eliot, and Hardy. There's a fabulous movie version as well. - The Name of the Rose, by Umberto Eco. This medieval mystery is set in a monastic library, and the clash between the classical world and the church lies at its heart. - The Seven Sisters, by Margaret Drabble. After her divorce, a middle-aged woman organizes a group trip to follow the path of Aeneas and comes into her own. This book is much better than the plot sounds like it should be. Margaret Drabble is a scholar in her own right and the editor of the Oxford Companion to English Literature. - Three Junes, by Julia Glass. Intertwined stories of a family spread out throughout the world over the course of ten years. - Jonathan Strange and Mr. Norrell, by Susanna Clarke. Clarke does a marvelous job of mixing fantasy and historical fiction as she tells how magic returned to England in the 19th century. The pseudo-scholarly tone, complete with footnotes, makes this an unusual read. - Brat Farrar, by Josephine Tey. Tey combines literary fiction and mystery in the best possible way. The characters are well-drawn, and psychology combines with suspense to create a marvelous tension. Green tea, that is. 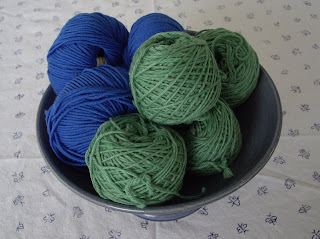 Sadly I missed out on the green beer and the green Chicago River while I was away on my knitting retreat this weekend. 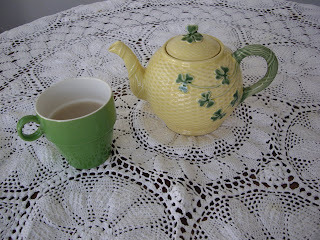 I couldn't resist busting out the shamrock teapot for a belated use, though. The white crocheted tablecloth is courtesy of my mother. It reminds me a bit of something that the old dears in Arsenic and Old Lace would have used. Not exactly my style, but it looked a little Irish to me. The retreat was a lot of fun -- plenty of cooking, movies, baking, walks, and, of course, knitting. It's hard to see in this photo, but there's lovely applied cable trim along the cuffs and hem of the sweater. I'm using RYC Cashsoft Baby DK. 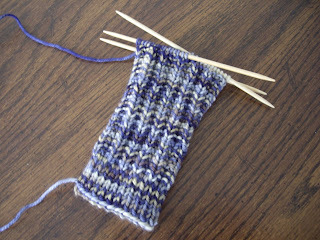 I enjoy knitting with it, but it seems awfully stretchy, and it's a pain to bind off for some mysterious reason. 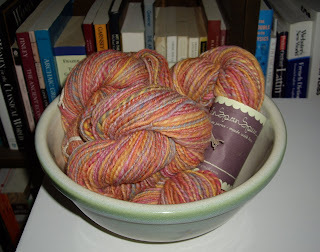 Here's some project spectrum yarn goodness to make up for the lack of actual knitting content. I'm still surrounded by a mountain of final exams to grade. For those of you in the Chicago area, Loopy Yarns has a great sale on "winter" yarns (25% off anything with wool, alpaca, or mohair) through Sun. 3/18. 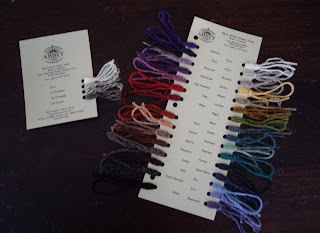 Blackwater Abbey actually sends out their color cards gratis, which I think is lovely. The colors are beautiful. Now I just need to pack my knitting projects! 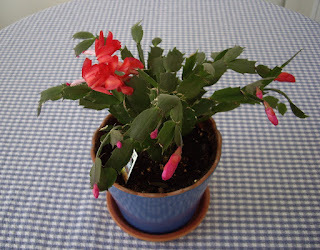 When my Christmas cactus sported two lousy blooms at Yule, I was a bit disappointed. But what do we have here? Apparently it's a St. Patrick's cactus this year. 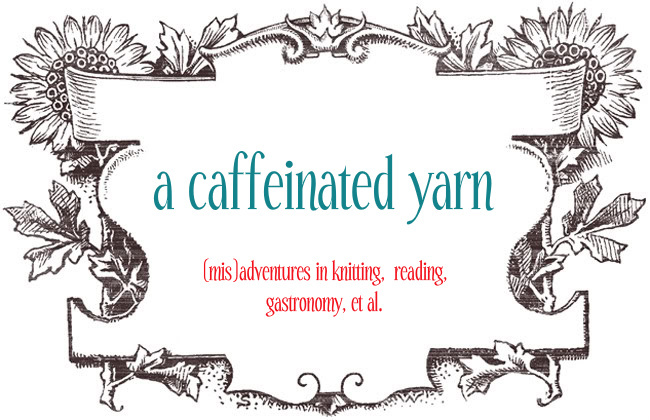 This weekend I'm heading off with my knitting group to an inn in Michigan for a knitting retreat. What a great way to end finals week! Hopefully I'll finish my grading before we leave. I still need to gather up my projects and yarn. Karin and I are responsible for dinner on Sat. 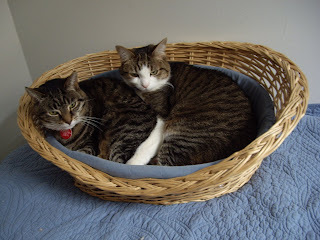 night, and we're making two of my favorite soup recipes: Mexican Vegetable Stew (check the Jan. archives) and Black Bean Soup, which is easy, healthy, hearty, and delicious. 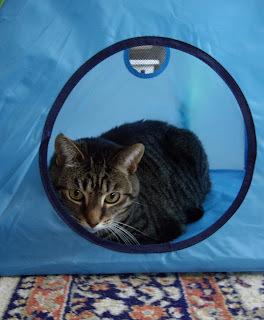 In fact, it's so easy that Paul sometimes makes it on his own. In a small bowl, cover the sun-dried tomatoes with the boiling water and set aside. In a soup pot, sauté the onions, garlic, and chile in the oil for about 5 minutes, stirring frequently, until the onions are translucent. Add the cumin, 1/3 C. water, and the juice from the tomatoes. Break up the tomatoes by squeezing them into the soup pot, or chop them coarsely right in the can and add them to the pot. Cover and bring to a boil. Lower the heat and simmer, covered, for 5 minutes. Add the black beans and their liquid, and continue to simmer, stirring occasionally to prevent sticking. Drain and chop the softened sun-dried tomatoes. Add them to the soup and cook for 5-10 minutes longer, until the onions are tender. Stir in the cilantro and remove the soup from the heat. Option 1: Puree half of the soup in a blender or food processor and return it to the pot. Option 2: Run a hand-held immersion blender through the soup to puree it a bit. If the soup is too thick, add some water or tomato juice. Reheat gently. Serve each bowl of soup with a dollop of plain yogurt or sour cream or grated cheddar cheese. From Moosewood Restaurant Cooks At Home, one of my favorite cookbooks. At long last Wavy is done. I like the finished scarf, but it was an awfully dull knit. 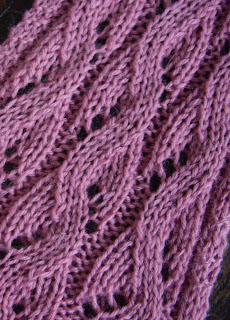 There was enough pattern checking that I couldn't just space out and knit while reading, but the pattern wasn't intricate or challenging enough to be very stimulating. 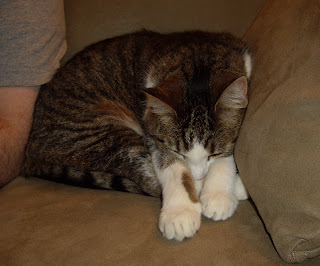 Friday was a crappy day, filled with cleaning up cat vomit, getting stuck in a malfunctioning car wash, and dealing with a particularly trying student. Drowning my sorrows in a couple pints of Woodchuck at the pub with friends, then seeing the new version of Casino Royale cheered me up a bit. Daniel Craig plays a pretty good Bond, better than Pierce Brosnan (or Timothy Dalton, for that matter). I was pleased to see less focus on gadgets and gizmos than in the Brosnan 007 movies, but I'm still a bit puzzled as to how playing poker was supposed to help the British government. Sunne has confirmed that the LMKG scarf does curl quite a bit. Since my brother is definitely a low-maintenance guy when it comes to his wardrobe, I frogged it and started on the Guy Scarf, my first cable project. 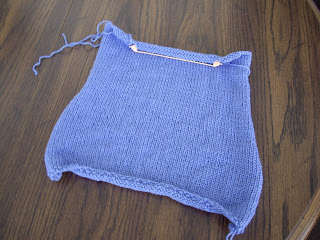 Cables are fun and not so tricky after all, especially since I'm using a cable needle. 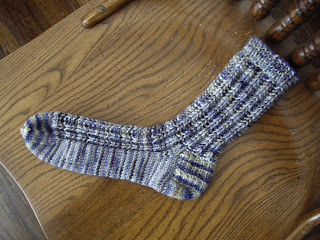 The first Campfire sock has been done since last Friday. 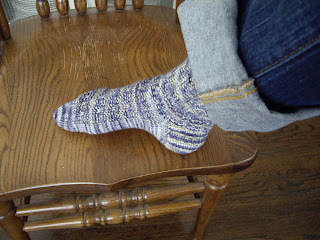 I'm very pleased with it, but it's true that DK weight socks are a little difficult to cram into shoes. They're just fine with clogs, though. 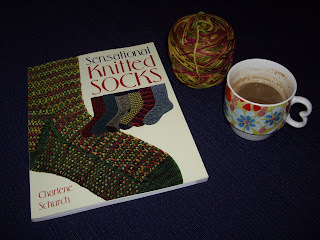 Perhaps I'll branch out and try sportweight socks next, but I'm still keeping my distance from those size 0 needles. - Lana Borgosesia Merino Otto, in the smurfiest shade of blue (4 balls). - Pear Tree 8-ply merino, in moss (4 skeins). So soft and lovely, with little white slubs interspersed among the green. Destined to become a scarf and hat for a friend's birthday. 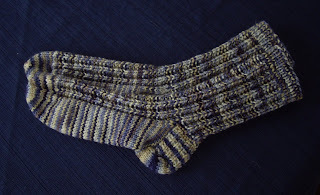 The Lana Borgosesia Otto is an unusual yarn for me. It's very rope-y and springy, and it almost doesn't feel like wool as I'm knitting with it. Smurf blue is not my color of choice, but I'm knitting a scarf for my brother who has specifically requested a bright med/dark blue. It seems that, despite being a native Minnesotan, he does not own a scarf and has stooped to borrowing my dad's. 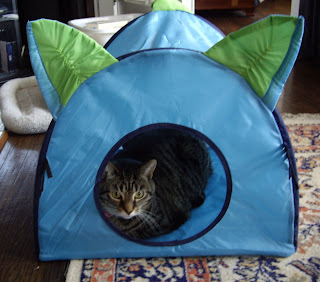 He has had a rough winter, so I'm going to send it to him with a couple sci-fi DVDs. 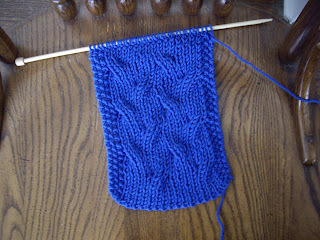 I started the "Cashmere Scarf" pattern from LMKG, but it has an awful tendency to curl, at least at this gauge. 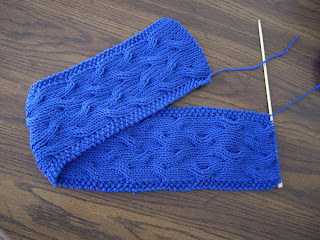 I'm thinking about starting over with the Yarn Harlot's easy peasy one-row wonder, a tried and true scarf pattern. If anyone has any quick, masculine scarf suggestions, please speak up! 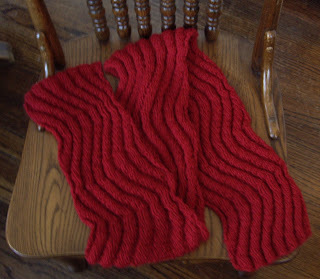 Mia knit me a lovely red scarf that I'm looking forward to wearing jauntily with a black sweater. Please excuse the bad photography. 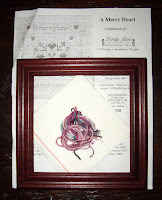 She also sent me some linen and evenweave, along with patterns, thread, and frame, in her forementioned attempt to lure me away from the dime store Aida I usually use for my needlework projects. 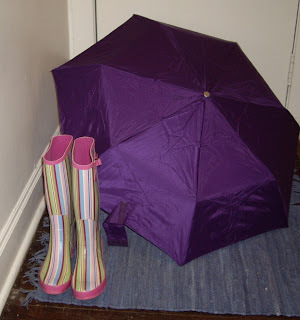 Today was a good day to bust out the pink striped Wellies. The campus walkways were alternately dotted with puddles and completely deluged. Winter quarter is drawing to a close, and I feel like everywhere I go, my students keep popping up with questions about the exam, the text, sight reading practice, office hours, and Latin grammar. It's a little disconcerting, but I'm glad they're taking it seriously. 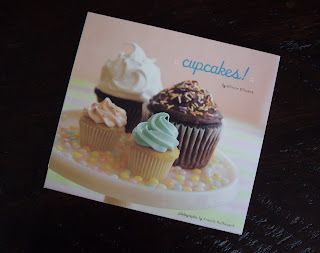 Sheri posted this recipe from her friend Dynna. It's easy, yummy, and actually has some elements of health in it (dried cherries, pecans, oats). 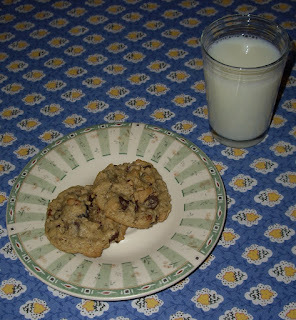 Just so that we wouldn't be overwhelmed by all that "healthiness" I threw in some chocolate chips, too. 1. Beautiful sportweight merino yarn handspun by Kristin I have 432 yds. Any ideas what I should do with it? 2. Alicia's fabulous crochet projects. And Jane's. And Posy's. And Brainylady's. 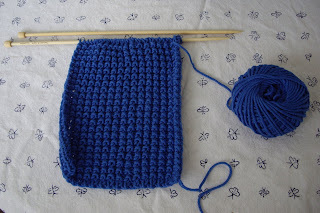 I need to learn to crochet. I taught myself to do a foundation chain yesterday, but that's it so far. 3. My home state ROCKS. 4. Mia sent me a lovely and thoughtful package of goodies. She's trying to convert me from Aida to linen and evenweave for needlework. I have a feeling that this is a little like trying to get a newbie knitter to buy real wool rather than Red Heart acrylic. 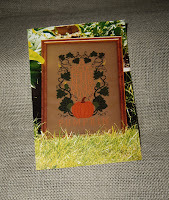 I'm not a newbie needleworker, though, just one who fears change. Pics tomorrow, provided that the sun comes out. 5. Wayne Coyne and the Flaming Lips. Have you heard/read Wayne's essay on NPR's "This I believe" yet? Here's a link. Also check out what Leah has to say about it. The Flaming Lips were awesome at Lollapalooza last summer, by the way. Those guys put on a great, high-energy show with plenty of enthusiasm and rocking out. Here's a funny thing. As I was sitting in my dining room while working on this post, I heard someone outside walking by outside while singing, quite loudly, "The Yeah Yeah Yeah Song (With All Your Power)." He had his headphones, and he looked to be having quite a fine time out walking about in the rain.